Social work has come a long way from the days of Jane Addams and Hull. Time and technology has created dilemmas that could not have been imagined. Read about the emerging issues and find that the answers are not always easy. Dateline: July 1897, Toronto, Canada. Social work pioneer Mary Richmond, director of the Baltimore Charity Organization Society, addressed the assembled at the National Conference of Charities and Correction. She implored her audience to support the creation of a formal training program for what we today call social workers. Richmond proposed the development of a "Training School in Applied Philanthropy." In relatively short order formal education programs emerged; the social work profession began to blossom. And Mary Richmond's influence continued: In 1922 she published a profoundly influential book, What is Social Case Work?, in which she reflected on the importance of what she calls "social case work in being" and "human interdependence." An important theme in this scholarly lodestar is that relationship is an essential element in social work. Imagine Mary Richmond's reaction if she were to learn that today's social workers have the ability to assist clients they may never meet in person using, for example, video counseling technology, online social networks, smartphones, avatars, text messages, and e-mail. The advent of digital and other technology has introduced a wide range of unprecedented ethical challenges related to social workers' delivery of services to clients, communication with and about clients, management of confidential case records, and storage of information about clients. Although recent technological innovations in social work have burgeoned, social workers' use of some forms of modern technology began in the early 1980s in the form of online self-help support groups. By the late 1990s, groups of clinicians were forming companies and e-clinics that offered online counseling services to the public using secure websites. Early developments included social workers' use of information technology and Internet resources, such as online chat rooms and Listservs joined by colleagues, professional networking sites, news groups, and e-mail. Today's social work services include a much wider range of digital and electronic options to serve clients who struggle with health, housing, mental health, and behavior issues, among others. For example, hundreds of online counseling services are now available to clients. People who experience depression, borderline and bipolar issues, addiction, marital and relationship conflict, anxiety, eating disorders, grief, and other mental health and behavioral challenges can use electronic search engines to locate clinical social workers who offer counseling services using live online chat. Clients can purchase online therapeutic chat services in various time increments paid for by credit card. Live online chat is an example of what computer experts call synchronous communication, meaning it occurs simultaneously in real time. This contrasts with asynchronous communication, where communication is not synchronized or occurring in real time (for example, when a client sends a social worker an e-mail or text message regarding a clinical issue and waits for a time-delayed response). Some social workers also provide long-distance counseling services by telephone, sometimes to clients they never meet in person. After providing a counselor with a username and credit card information, clients receive telephone counseling. Practitioners also offer clients live video counseling using webcams, pan-tilt zoom cameras, and monitors. Some social workers offer individual and group counseling services to clients by using a 3D virtual world where clients and practitioners interact visually with avatars rather than real-life photos or live images. An avatar is a digitally generated graphic image, or caricature, which can be used by clients and social workers to represent themselves in a virtual world, appearing on their computer screen. Clients and social workers join an online therapy community, create their avatars, and electronically enter a virtual therapy room for individual or group counseling. A very recent development offers people who seek help relationships with clinicians that are limited entirely to text messages. Clients pay a monthly fee and can exchange unlimited text messages with a clinical social worker they never meet in person. Social workers and their clients also have access to a wide variety of automated online assessments and interventions designed to help people who struggle with diverse mental health and behavioral issues. Users complete online questionnaires concerning their mental health and behavioral challenges, and then receive electronic feedback, which is sometimes generated by artificial intelligence software, and hyperlinks to resources that may help them address their issues. Users who indicate a wish for help directly from a clinical social worker are provided links to service providers who offer distance counseling services. Many social workers incorporate smartphone apps as clinical tools clients can use. An increasing number of clinical programs encourage or require clients to download apps on their smartphones to record information about their clinical symptoms, behaviors, and moods; receive automated messages from treatment providers, including positive and supportive messages; obtain psychoeducation information about, for example, coping strategies and risk reduction; and obtain links to local resources, including locations of 12-step meetings. Clients who want to avoid high-risk locations can insert specific addresses into the app, which then uses GPS technology to send the client an electronic text warning if the client is in or near the high-risk location (for example, when a client who is in recovery wants to avoid certain neighborhoods known for drug activity). Social networking sites, such as Facebook and LinkedIn, are now pervasive in both clients' and social workers' lives. Some clinicians believe that maintaining online relationships with clients on social networking sites can be used as a therapeutic tool; they claim that informal contact with clients on social networking sites can empower clients, humanize the relationship, and make practitioners more accessible. Many websites offer people the opportunity to receive mental health services by exchanging therapeutic e-mail with clinical social workers. Typically these practitioners invite users to e-mail a therapy-related question for a flat fee and guarantee a response within 24 to 48 hours. Some clinicians offer clients monthly packages that include a set number of e-mail exchanges. Other practitioners choose to exchange occasional clinically relevant e-mails with clients as an extension of their office-based services. Some practitioners and some social service programs have incorporated text messaging as a formal and supplemental component in their intervention model. In these protocols, clinicians may draw on cognitive-behavioral treatment concepts, for example, to provide clients with automated positive and supportive text messages. Social workers' use of technology to help people in need is now sufficiently common that rigorous research is being conducted on its effectiveness. According to the National Institutes of Health website, clinicaltrials.gov, randomized clinical trials have been or are being conducted to assess, for example, the effectiveness of Facebook as a relapse prevention tool and to help prevent postpartum depression, text messages to enhance recovery among alcoholics who struggle with mood disorders, and e-mail to reduce the incidence of substance abuse among people with HIV. Since its formal inauguration in the late 19th century, the social work profession has developed a rich set of ethical standards to guide practitioners and professional practice. The proliferation of social workers' use of digital and other electronic technology to deliver services, store and access information, and communicate with clients, colleagues, and others has created new ethical challenges, particularly related to informed consent; privacy and confidentiality; boundaries, dual relationships, and conflicts of interest; practitioner competence; records and documentation; and collegial relationships. • Informed consent: The availability of distance counseling and other social services delivered electronically has enhanced social workers' ethical duty to ensure that clients fully understand the nature of these services and their potential benefits and risks. Obtaining clients' truly informed consent can be especially difficult when social workers never meet their clients in person or have the opportunity to speak with clients about informed consent. Special challenges arise when minors or people with intellectual disabilities contact social workers and request distance or remote services, particularly when social workers offer services that do not require credit card information; for example, state laws vary considerably regarding minors' right to obtain mental health services without parental consent, and this can pose unique challenges when a minor and the social worker reside in different states with different laws. • Privacy and confidentiality: The rapid emergence of digital and other technology used by social workers to deliver clinical services has added a new layer of challenging privacy and confidentiality issues. Social workers who offer video counseling services, for example, must recognize that they have much less control over confidentiality than when they provide traditional office-based services. For example, a client receiving video counseling services may invite a family member or acquaintance to sit in on a session—outside of camera range—without the social worker's knowledge or consent. Also, social workers who exchange sensitive e-mail or text messages with clients cannot control whether clients forward messages to third parties without the social worker's knowledge. Social workers must review and adhere to relevant laws and regulations related to privacy and confidentiality, including federal laws (e.g., Confidentiality of Alcohol and Drug Abuse Patient Records regulations [42 CFR Part 2], HIPAA, and the Health Information Technology for Economic and Clinical Health Act) and state laws pertaining to the confidentiality of mental health records and exceptions to clients' right to confidentiality to protect clients and third parties from harm. Further, social workers must use sound judgment about conducting online searches to gather information about clients (e.g., Google or Facebook searches) without clients' knowledge or consent; some clients may feel overexposed and violated by clinicians' attempts to conduct online searches for information about them. In addition, social workers must know how to respond to subpoenas and court orders to release what lawyers refer to as electronically stored information; complex legal and ethical standards are evolving regarding third parties' right to electronically stored information during legal proceedings (such as child custody or criminal court proceedings) and clinicians' ability to protect this information. • Boundaries, dual relationships, and conflicts of interest: Social workers have a duty to avoid conflicts of interest that may harm clients. For example, social work administrators should not use subsidized online technology to provide services that require clients to view commercial sponsors' advertisements posted on the computer screen used for distance counseling services. Clients may believe that their social workers endorse these products and services or benefit from sales. Clinicians who work full time in an agency setting should not refer clients to their own part-time online private practice for additional services. Social workers' use of digital technology has also introduced new and complicated boundary issues. Many social workers receive requests from current and former clients asking to be social networking "friends" or contacts. Electronic contact with clients and former clients on social networking sites can lead to boundary confusion and compromise clients' privacy and confidentiality. Electronic message exchanges between social workers and clients occurring outside of normal business hours, especially if the social worker uses a personal social networking site or e-mail address, may confuse practitioner-client boundaries. Social workers who choose not to accept a client's "friend" request on a social networking site may inadvertently cause the client to feel a deep sense of rejection. The around-the-clock access that digital technology makes possible creates elastic boundaries that are new to social workers who otherwise have been able to maintain clear boundaries when services are provided in person during traditional working hours. Clinical social workers must also think carefully about maintaining digital and electronic relationships with former as well as current clients; easy access via electronic means can introduce ethical and clinical challenges related to boundaries. • Practitioner competence: The relatively recent emergence of digital and other technological tools has added a new set of essential competencies for social workers who choose to incorporate these tools in their work with clients. Use of this technology requires a great deal of technical mastery in addition to awareness of, and compliance with, rapidly developing standards of care and ethical guidelines. Social workers who use digital and other technology must know how to develop protocols to screen potential clients, obtain clients' informed consent, assess clients' clinical needs, refer potential clients to colleagues when people require in-person services to address their needs, maintain confidentiality, encrypt sensitive information, maintain clear boundaries, manage documentation and client records, and terminate services. Social workers must be aware that some state laws prohibit out-of-state social workers from providing distance services that are received in states in which the social workers do not hold a license. • Records and documentation: Social workers' use of online and other electronic technology has posed novel documentation challenges. Social workers must develop strict protocols to ensure that clinically relevant e-mail, text message, social networking (e.g., Facebook), and telephone exchanges are documented properly in case records. 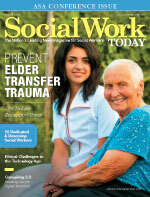 Further, social workers must develop guidelines that ensure proper encryption; reasonable and appropriate access by clients and colleagues to records and documents (e.g., when a social worker is incapacitated and a colleague provides coverage); documentation of video counseling sessions, e-mails, text messages, and cybertherapy communications; compliance with laws, regulations, and agency policies concerning record and document retention; and proper disposal and destruction of documents and records. • Collegial relationships: Traditionally, collegial interactions among social workers have occurred in person, in the context of agency-based meetings, and by telephone. Increasingly, however, collegial interactions are occurring online and in other remote forms. Social workers must ensure that they treat colleagues with respect when posting comments online; avoid cyberbullying and collegial harassment; avoid derogatory and defamatory postings; respect colleagues' privacy (e.g., avoiding gratuitous and unwarranted Google searches for unprofessional purposes); respect colleagues' online work products (e.g., avoiding plagiarism, unauthorized uploads); and respond appropriately to colleagues' unethical online conduct (e.g., inappropriate postings, cyberbullying). Modern technology has transformed the nature of social work practice. Many contemporary social workers completed their formal education and entered the profession before currently available technology was invented. Today's practitioners have the capacity to serve clients they never meet in person. Even social workers who maintain traditional office-based services and programs have the option to interact with clients outside the office using technology. The social work profession that Mary Richmond helped launch in the late 19th century seems quaintly anachronistic when compared with today's social work in the technological age. Twenty-first-century social workers must make thoughtful decisions about whether and to what extent they will incorporate technology into their professional lives. They must reflect on the meaning and nature of the professional relationship and the ways in which technology enhances or challenges it. Social workers' use of technology should draw on prevailing ethical standards, recognizing that new technological innovations and options are likely to develop swiftly. Core ethics concepts in social work related to informed consent; privacy and confidentiality; boundaries, dual relationships, and conflicts of interest; practitioner competence; records and documentation; and collegial relationships will continue to be relevant. What is almost certain to change is the way in which these time-honored concepts are applied to new technological developments in social work.